Is there a dye that can colour PET (polyethylene terephthalate)? I’m wondering if there’s a dye that can colour PET (polyethylene terephthalate)? iDye Poly dyes polyester and other synthetic fabrics. 16 colors including black! Yes. PET is a common form of polyester, which can be dyed with a class of dyes known as disperse dye. Disperse dye is only slightly soluble in water, and works best on polyester when used with a carrier chemical. Without a carrier chemical, you can achieve only paler shades on polyester. Dyes that are made for use on cotton or wool will not work on PET and other forms of polyester. For more information, see my page, “Dyeing Polyester with Disperse Dyes“. In Australia, you can buy disperse dyes under the brand name of Polysol, from Batik Oetoro, or Polytex, from Kraftkolour, or you can buy Jacquard brand iDye Poly (not iDye without the Poly, which is for natural fibers) from companies that import Jacquard products. For contact information for dye suppliers in your area, see my page, “Sources for Dyeing Supplies Around the World”. This entry was posted in disperse dye, dyeing polyester on January 21, 2017 by pburch. For polyester, do you know anything about Rit DyeMore (for synthetics)? Message: For polyester, do you know anything about Rit DyeMore (for synthetics)? Dyes polyester and cotton-poly blends, acrylic, acetate and nylon by stove top dye method. 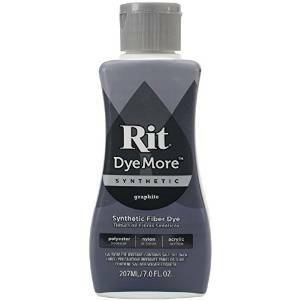 Rit DyeMore, introduced only a year ago, contains a type of dye called disperse dye, which can be used to dye synthetic fibers including polyester, nylon, and acrylic. Disperse dye is the only type of dye that works on polyester. Rit All-Purpose dye cannot be used to dye polyester. It is impossible to tell which specific dyes are contained in the different colors of Rit DyeMore, which is not surprising because this is nearly always the case for dyes that are sold under the Rit name. (The only exception is the colorless ultraviolet-blocking Sun Guard dye.) They are probably among the lower-energy type of disperse dye, which require less heat or assisting carrier molecules, but which transfer more quickly to polyester from a dyebath than higher-energy disperse dyes. I am not sure, but it seems possible that Rit DyeMore formulas may also contain direct dyes, in addition to the disperse dyes for polyester. Direct dye is for dyeing cotton, rayon, and silk. The Rit dye company appears to advise that DyeMore will also dye cotton or rayon, which we know that disperse dye is not good for, though they do say DyeMore will not dye wool. Disperse dye can stain cotton, but does not bond to it well enough to make it suitable for use as a cotton dye. It’s important to note that there is no true black in the Rit DyeMore line of dyes. The darkest color in the range is “graphite”, which is a dark gray. For a true black on polyester, you should consider one of the other brands of disperse dye. The colors available in the Rit DyeMore line are named as follows: Daffodil Yellow, Sand Stone (tan), Apricot Orange, Racing Red, Super Pink, Royal Purple, Sapphire Blue, Kentucky Sky, Peacock Green, Frost Gray, and Graphite. If the colors available in the DyeMore line do not match what you need for a specific project, they are not the best choice for mixing different colors. The yellow has too much orange in it to be an ideal mixing primary, and there is no pure cyan. I would recommend one of the other brands of disperse dye for color mixing. Polyester requires high heat to accept disperse dyes. There are two ways you can supply this: either by boiling the fabric in a dyebath, which is a large pot of water with the dye and auxiliary chemicals, or using the dye to make designs on paper, which can then be transferred by ironing them on. Disperse dyes that have been selected to be suitable for the latter method are often labeled as “transfer dyes”. Rit DyeMore is intended only for use in the dyebath method. Dyeing polyester with Rit DyeMore requires heating the fabric in the dye on the stovetop at a minimum of 180°F (82°C), preferably closer to boiling (212°F or 100°C), for at least thirty minutes. (Instructions are available at the Rit website). Other materials such as acetate and acrylic will generally take this sort of dye with less heating. The cooking pot used must be large enough for the material to move quite freely in the water, unless you are interested in a non-uniform “crumple dye” effect. As with all textile dyes that are not originally sold as food coloring, the Rit DyeMore dyes should not be used in cookware that you plan to reuse for food preparation, as some of the dyes or auxiliary chemicals may be toxic or carcinogenic when eaten. Aluminum pots are not recommended because the salt in the DyeMore mixture will tend to cause corrosion to the aluminum, but if you have an inexpensive aluminum pot that you don’t want to save for kitchen use, it’s worth trying. Stainless steel pots and enameled pots are the best choice; enameled pots are less expensive than stainless steel, but if they become chipped inside can contaminate the dyes with iron, resulting in dull colors. One bottle of Rit DyeMore should be sufficient to dye one to two pounds of fabric, in three gallons of water in a sixteen-quart pot. Using a smaller cooking pot will result in less uniform colors. When dyeing a dark color, double the amount of dye used. Comparison of costs: as is typical of Rit dyes, the DyeMore line is quite dilute, compared to other dyes, which makes it more expensive than would appear at first glance; the bottle contains more water than anything else, just as Rit Powder Dye is mostly salt and detergent. One seven-ounce bottle of Rit DyeMore costs $5, or about nine dollars on Amazon, and will dye one to two pounds of fabric. 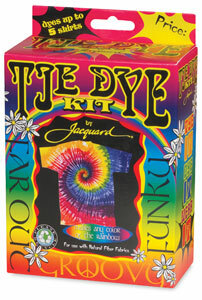 One small fourteen-gram packet of Jacquard iDye Poly costs $3.79 and will dye two to three pounds of fabric. 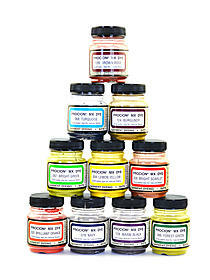 PROsperse dye is more concentrated; while four grams of it is sufficient for a medium shade, and eight grams for a dark shade, fifteen grams costs only $2.49 (plus shipping) on the PRO Chemical & Dye website, and bulk quantities are available at a steep discount (e.g., four ounces, or 120 grams, for fourteen dollars). Rit DyeMore, like Jacquard iDye Poly, is convenient for the beginning dyer who does not want to measure out salt or vinegar or other auxiliary chemicals. Nothing needs to be added to the DyeMore recipe, except for water and fabric. The formulation probably contains unspecified auxiliary chemicals known as dye carriers, which help polyester to accept dye without requiring temperatures well above boiling. 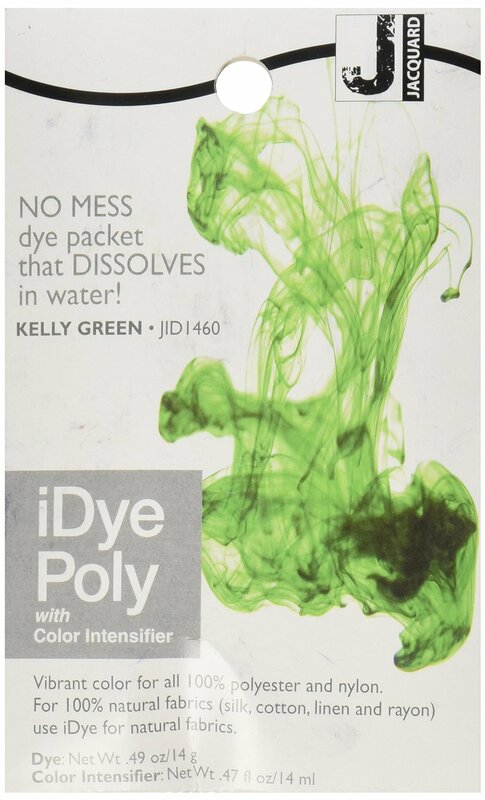 iDye Poly contains a dye carrier chemical in a separate packet within the iDye Poly package; it should be omitted when dyeing synthetics other than polyester, such as acetate or acrylic, as it is not needed for them. Some dye carrier chemicals are rather toxic and smelly, and all should be used only with good ventilation. Be sure to keep at least a window open when dyeing polyester; better to have an outward-facing fan in one window, and an inward-facing fan in another. The Rit DyeMore MSDS [PDF] is uninformative, as it is the same one supplied for Rit All-Purpose Liquid dye, which contains entirely different dye chemicals. It is a fine thing that Rit has introduced polyester dyes, because this may make them more accessible to more people, but the requirement to obtain a very large cooking pot for use with dyes, and not with food, makes immersion dyeing polyester an expensive project for the beginning dyer. Dyeing cotton with fiber reactive dyes requires much less investment, since they can be used at room temperature with plastic containers. Other brands of disperse dye cost significantly less than DyeMore per pound of fabric, and are available in colors that have been selected to be better for color mixing. This entry was posted in disperse dye, dyeing polyester, dyeing synthetic fibers on March 29, 2016 by pburch. iDye plus iDye Poly didn’t work on cotton pants. What is my next step? I have a quick question about dying. I have two pairs of pants, one in black and one in a light beige colour. Both are of the same style and fit, just different colours. Now that I’ve worn the black pants for about a year, they’ve faded quite a bit. I only wore the light beige ones several times. Now I want to dye both of them to black. On the tag, it says they are 98% cotton and 2% polyester (followed by another line that says 100% cotton; I don’t know, I bought these pants in Korea). 1A) If I do the stove-top method, won’t the intense heat cause my pants to shrink or the fibers to break down? 2) I have a front-loading washer. When I poured the pre-dissolved salt and iDye solution in the machine, it went through the holes in the washer drum and I’m not sure if some it got drained or not. But when I turned on the wash and came back 30 minutes later, the pants were all covered thoroughly in a black dye (which surprised me more when post-rinse and spin that the pants barely changed). Now, Paula, I seek your assistance. From Googling and doing some research, it seems that you are one of the more knowledgeable people on this topic on the internet and I am curious what you would recommend as my next step. The Fabric Dyer’s Dictionary, subtitled “900+ Colors, Specialty Techiniques, The Only Dyeing Book You’ll Ever Need!”, shows how to mix a small number of Procion dyes to obtain a large number of different solid colors. The problem is a combination of choosing the correct dye for the fiber, and using the correct temperature for the dye. The dye that I recommend for your project, Procion MX dye, will work well on cotton without having to use high heat. The iDye Poly works only on synthetic fibers and only when boiled with the clothing, at least at a simmer but preferably at a good rolling boil, for at least half an hour. iDye Poly does not work in the washing machine, because it’s not hot enough. Even when used correctly, though, it will have little effect on clothing that contains only 2% polyester. Only one thread in fifty will even take the dye at all! Polyester dye does not color cotton at all; no matter how you apply it, it will wash out of the cotton. It’s great for clothing that contains, say, 50% polyester, when combined with the plain iDye for natural fibers to dye the non-polyester portion of the fibers in the fabric. However, you are right to be concerned about shrinkage when boiling cotton or cotton-blend fabric. Seam stitching is nearly always made of polyester, which stays the original color when dyed with cotton dye. This may be a problem for you when you successfully dye your beige pants black with cotton dye. Did the iDye Poly color the threads at the seams of the beige pants? Probably not, because you were not heating the pants in the dye on the stovetop. Clothing that is 98% cotton is best dyed with fiber reactive dye, such as Procion MX dye. Fiber reactive dye is better than direct dye (the type that is in iDye for natural fibers), because it lasts longer in the clothing, and because it can be applied at room temperature. Direct dye requires very hot water, preferably close to boiling, though it can work in the washing machine if the water temperature is at least 140°F (60°C). If, like many people, you have your water heater set to 120°F or below, to reduce the risk of scald injuries, you are less likely to have acceptable results with direct dye, unless your washing machine itself heats the water to a much higher temperature. Unlike direct dye, Procion dye can be set with sodium carbonate (using either washing soda or soda ash, but not baking soda), instead of heat. It will work at temperatures as low as 70°F (21°C), though warmer temperatures are better. You can use a five- or ten-gallon plastic bucket, if you’re willing to stir it for an hour, or you can use a washing machine. Top-loading washers are better than front-loaders for dyeing, but there are instructions available for dyeing with Procion MX dye in a front-loader. Dharma Trading Company provides a recipe for “Garment Dyeing With a Front Load Washing Machine”, and Jacquard Products includes instructions for a front-loading washer near the bottom of their “Procion MX Instructions” PDF page. The fact that your pants did become visibly soaked with black dye is encouraging, even though that dye did not work. When dyeing black, always be sure to use a lot of dye. It takes more dye powder to obtain a dark black than to obtain any other color, regardless of what type of dye you are using. For each pound of dry cotton fabric that you are dyeing, you will want to use 30 grams of black Procion MX dye powder. That’s a whole ounce! Paler colors can be obtained with much smaller quantities of dye. In Vancouver, you can buy Procion MX dye from Maiwa Handprints. They have a shop on Granville Island, and they also sell online, as do Dharma Trading Company and other good dye suppliers. Another Canadian online source of Procion MX dyes is G&S Dye in Toronto. See my page of Sources for Dyeing Supplies Around the World. I have to mention one other possible cause of your problem. If the pants were treated with a surface finish, such as stain-resistance or an anti-wrinkle finish, even Procion dye may not work for you. There is always a risk of failure when re-dyeing commercially-made clothing that isn’t sold specifically for dyeing. It usually works out okay, but there’s a small but real chance that it won’t work at all. This entry was posted in direct dye, disperse dye, dyeing cotton, immersion dyeing, Procion MX dye, types of dye on October 25, 2014 by pburch.